Get 8 Days of Air Plant TipsYES, PLEASE! 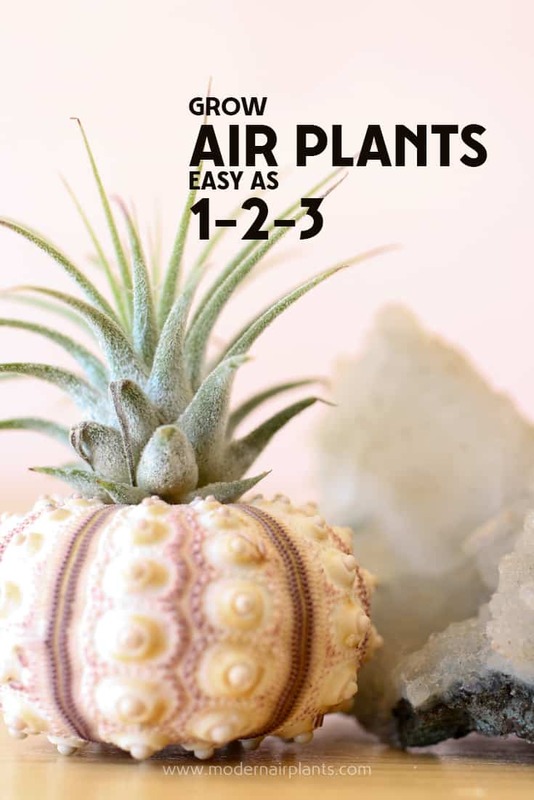 After purchasing these other-worldly, totally fascinating plants you may be wondering, “how do you take care of air plants?” No worries, I will walk you through the three basic needs of air plants: air, light and water. This post may contain affiliate links, and I love all the products I promote. 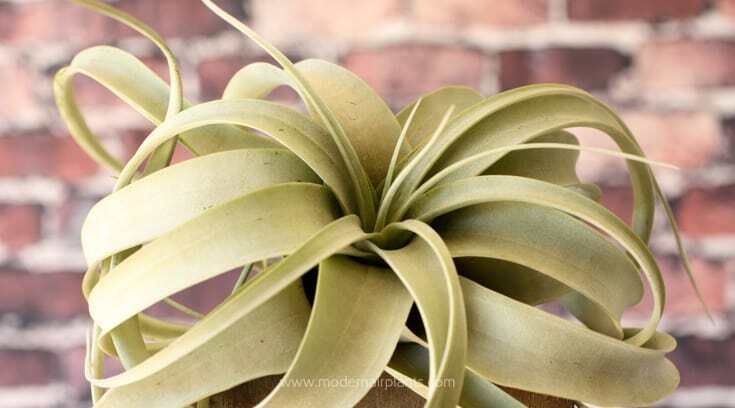 Let’s talk about 3 ways air affects air plants: temperature, humidity and air circulation. Temperature directly affects how often air plants need water. 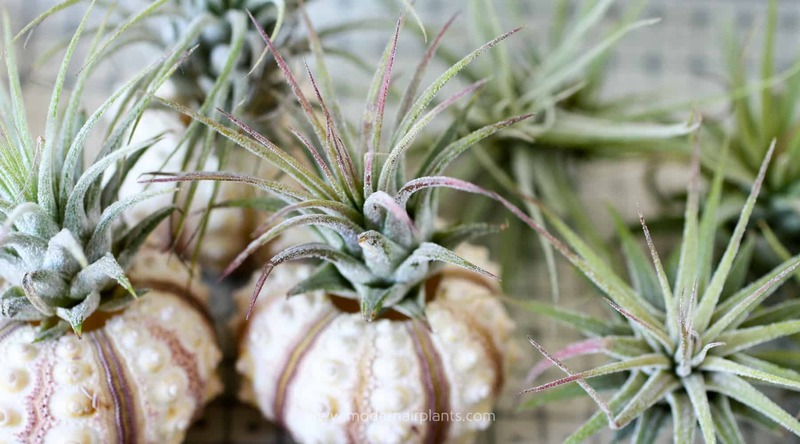 The higher the temperature, the more often your air plants will need water. 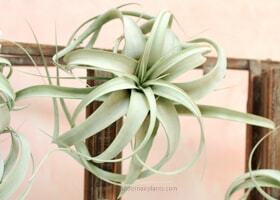 Air plants need more than is readily available in the air. 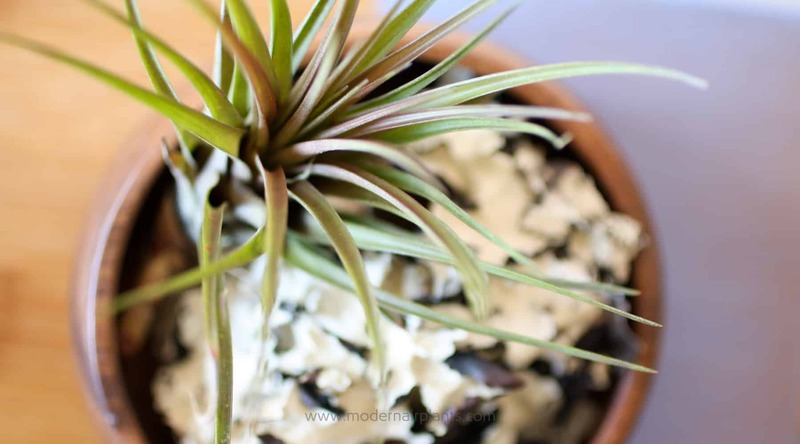 Humidity levels will also determine how often your air plants need water. And, the higher the humidity the less often your air plants will need to be watered. The vice-versa is also true, less humidity means watering more often. 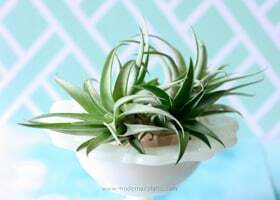 Air circulation is important to keep air plants healthy. If water is left on the leaves after watering it can cause the air plant to rot. Not good. To prevent this, air movement will help the excess water from collecting inside the inner layers of the air plant causing rot. 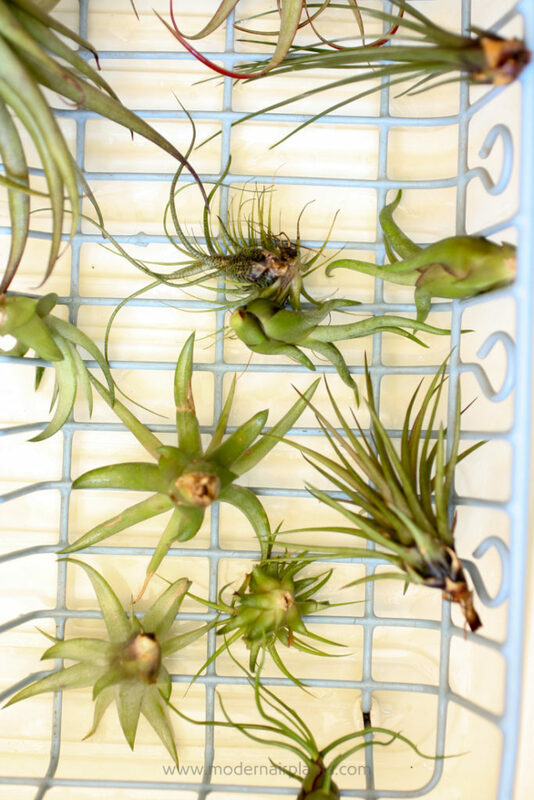 On the flip side, keeping air plants away from air conditioning and heating ducts is important for preventing the air plants from drying out too quickly. 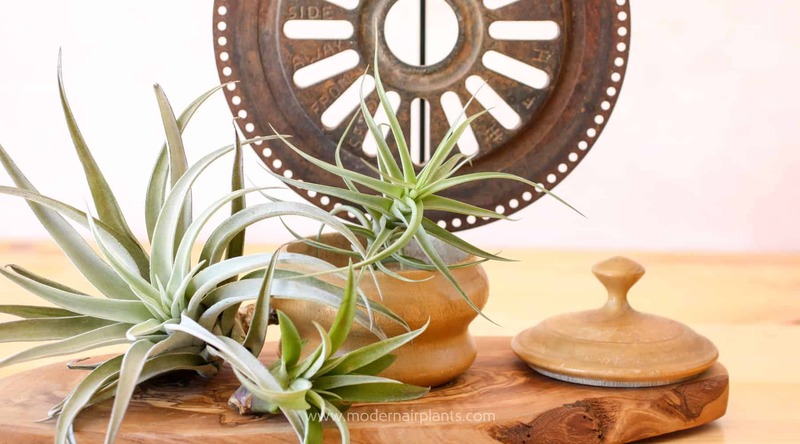 This Tillandsia xerographica receives lots of air ventilation sitting atop this wood vase. Air plants prefer bright, indirect light. About 3 feet away from a window is usually just right. Although allowing some direct light can beneficial for bringing out additional color in some varieties. Just be cautious that your air plants don’t dry out or sunburn. Did I mention to be very careful if you do place your air plants in direct light? A dark spot on the leaf may be an indicator of sunburn. There is another alternative: rotation. If you’re you willing to rotate your air plants then you can have a display anywhere as long as they are rotated back into an ideal location about every week. An easy way to remember to rotate is when you water. Another way to ensure your air plans get the light they need, you can always purchase a light. Just turn it off at night, and away you go. I love this bowl of Tillandsia ionantha ‘Fuego’ and Tillandsia harrisii nested in dried Tillandsia usneoides ‘Spanish moss’. To keep it in top condition, I rotate it from my dresser top back to an east window, its ideal light location. 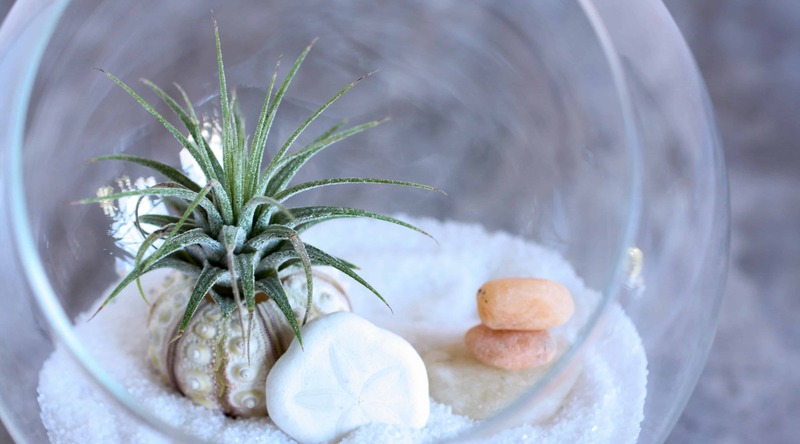 How do you plant an air plant? 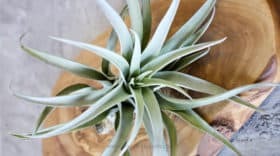 I want to tell you the #1 reason air plants are so different from other plants. You do not plant air plants. 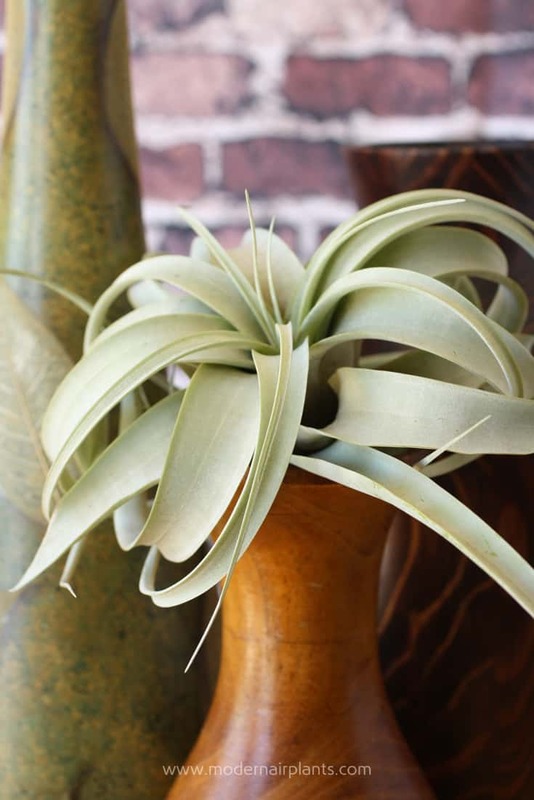 Unlike other plants, air plants do not absorb water, or other nutrients, through their roots. Instead they have trichomes on their leaves that absorb water and nutrients. Not only does this mean that air plants can be displayed in ways that other plants only dream about, it also means that the way we water air plants is different from the way we water other plants. There are 3 main ways to water air plants: spray, dunk and soak, with soaking being the primary mean of watering. To mist your air plant, spray water all over your plant, even under the leaves, until it is dripping with water. If the plant is in a closed, or semi-closed container, lift it out before misting. 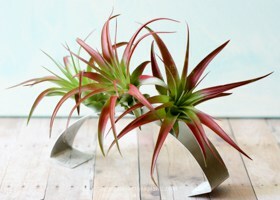 This will keep water from collecting inside the container and causing potential harm to your air plant. T. capitata peach is ready for a refreshing mist. 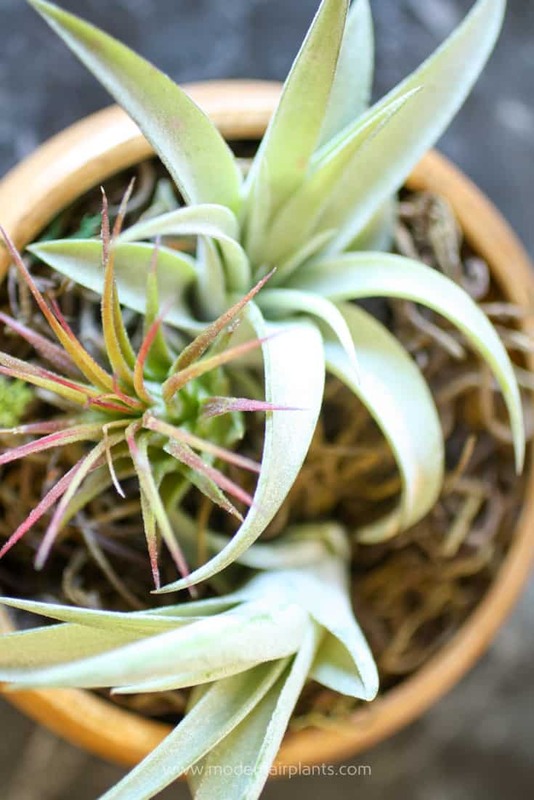 Giving your air plant a good all-over spritzing is like a quick pick-me-up. It’s a sip of water, but not a drink–certainly not life-sustaining. Feel free to mist your air plants if it’s really hot or if for some reason you need to extend the time between watering. I keep a spray bottle on hand and give my air plants a spray whenever the fancy hits. Several dunks in water a few times a week is another option. You can get it done pretty quickly if you’re short on time. 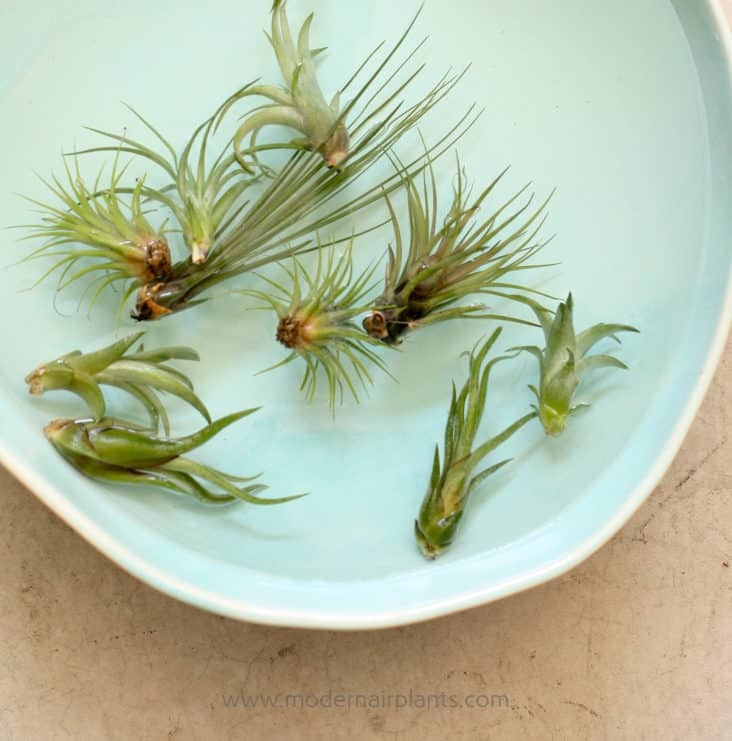 Placing your air plants in a colander and letting the water run over them will produce a similar result. 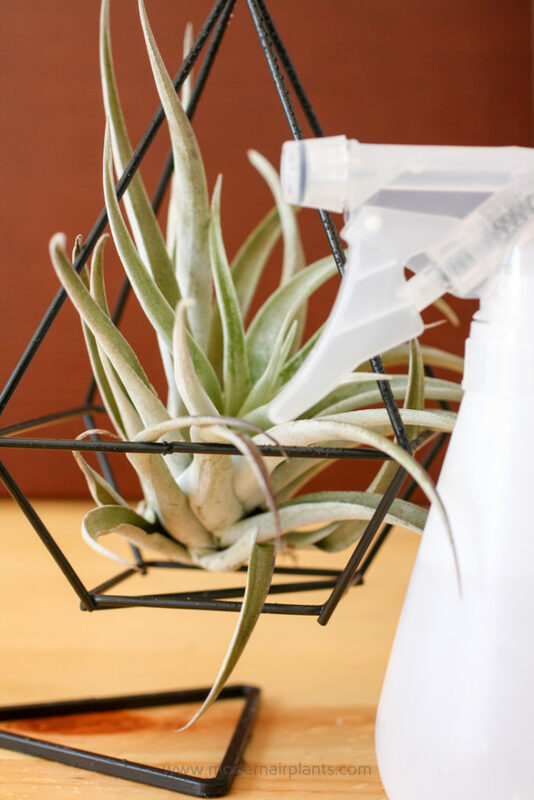 Like misting this is a good way to cool off your air plants, or to extend the time between watering, but will not completely hydrate your plants. Giving my T. tricolor v melanocrater a quick, cooling dunk. The soaking method works best because it lasts the longest. 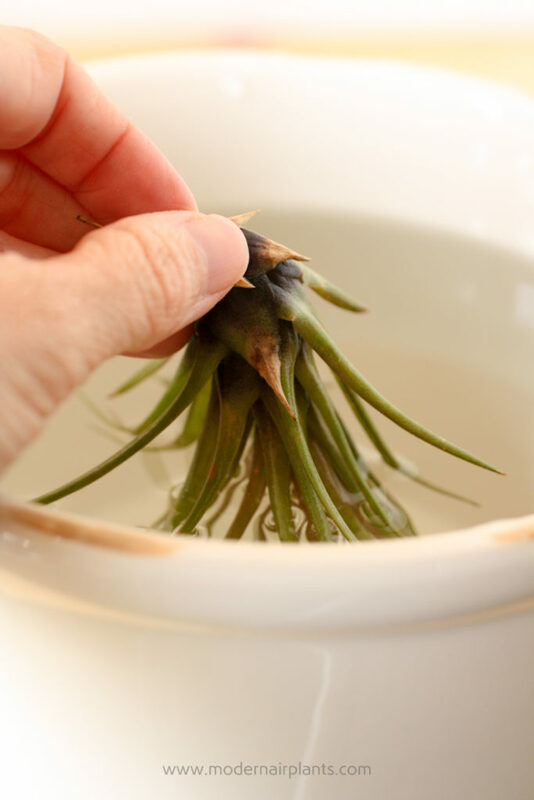 Place your air plants in a basin or bowl of water and let them soak. Let the humidity in the air be your guide. You will need to soak your plants for less time if you live in a wet climate, and for up to 4 hours if you live in a very dry climate, like I do. Tip: If the air plant is in flower, keep the flower dry or the flower will fade more quickly. Tip: Never use soft or distilled water. Let tap water sit for a few hours to let the chlorine and other chemicals evaporate. If available, pond or rainwater is ideal. Bottled water will also work. Air plants enjoy a nice bath to rehydrate all those thirsty trichomes. After watering, your plants need to dry out to prevent rot. Simply set the plants on their side on a towel, or dish drainer. Allow the plants to dry completely before returning them to their display. Provide your air plants with air, light and water, and your air plants are off to a great start! Having trouble finding air plants in stores? You're not alone. I’m old-school and don’t have central air in my house, so we have several swamp coolers. It makes it not *terribly* humid in my house, but it does put out a lot. What’s the best way to make sure my plants don’t get too much water via the air? Thanks so much! Thanks so much for your comment! Too much humidity is not a problem. 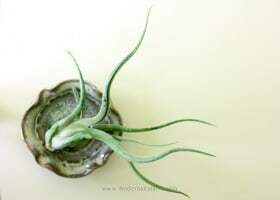 Just remember that in addition to the humidity in the air, your air plants also require a good soak in a basin of water for several hours, once a week. Best of luck with your air plants!